Announcement ♥ Thank you for stopping by! ♥ Thank you for stopping by! Absolutely thrilled with this item! Customized exactly as requested, arrived quickly, looked great. I was a bit worried because I never tried a project like this, but it was easy (just took a bit of time to do 24) and the favor boxes were a big hit at the bridal shower! Thank you, Paula! These are soooo cute and we’re very easy to print and cut. My son was so excited to see them and hand them out to his friends and family. Great response time and execution of requested edits. Loved this print yourself label! Easy to use PDF file. All of our cards are professionally printed on beautiful card stock. • Front and back full color printing. • Your choice of paper (Pearl, Premium Cotton and Bamboo paper prices not included - extra cost, convo me for more information). ♥ The turnaround for printing is 4-6 business days. Rush shipping is available for $12.00 extra and the turnaround for printing is 2-4 business days. ♥ Please remember that the color of your card may be off a little due to monitor screen color adjustments and the variety of printing processes. ♥ I highly recommend DOUBLE CHECKING your design. 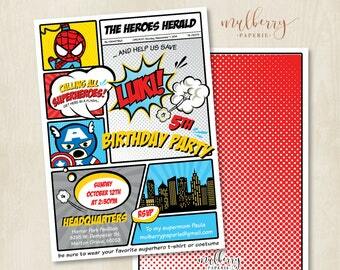 Once your proofs for invitations are approved, Mulberry Paperie is not responsible for errors. ♥ We do NOT accept any returns or exchanges. ♥ Photos should be high resolution for proper print quality. I cannot be held responsible for photo quality. ♥ Please keep in mind that Mulberry Paperie will not begin customizing or designing until payment is made and has cleared through Paypal. Keep this in mind when you choosing an ECheck through Paypal. EChecks usually take 3-4 business days to clear. ♥ Payment is expected upon checkout. If no payment has been received within 72 hours, a message is sent and if not answered your order will be cancelled and it will be re-listed. ♥ When applicable, I ship via UPS or USPS within 2-3 business days after payment. Most orders in the US arrive within 5-7 business days. Please allow 3-4 weeks for international delivery. ♥ It is illegal for me to use images that are copyrighted without the permission of the photographer or company that holds the copyright. By submitting me the photos, you agree that you are the photographer or have permission in the form of a copyright license from the copyright holder. ♥ Our PDF files are password protected. ♥ This file is for personal use only. Mass production, file sharing and commercial use of this file is strictly prohibited. BluGrass Designs and Mulberry Paperie retains all rights. ♥ Feedback is a great tool that allows me to know that you are happy with your order. But if for any reason you are unhappy please contact me before leaving a negative feedback. I will be more than happy to work with you to reach a satisfactory resolution.